I have a new favorite summertime treat. And – almost unbelievably – it’s not ice cream! It’s a sandwich. It’s an amazing sandwich. But before I get to that, will you bear with me while I ramble more generally about cherries for a little bit? Oh good. I have a list of things that make summer summer. It’s a list that’s pretty much just inside my head. Its length is indeterminate and its contents ever shifting. But, it only shifts around the edges. There are some core elements that stay the same. Jumping off of large rocks into water that feels like it was ice only moments before, then screaming and laughing and scrambling out, feeling extremely refreshed. Going for runs only to find that I’m spending most of my time rummaging through berry bushes looking for treats. Drinking coffee outside in the sun. Long bike rides or hikes followed by more coffee. Going barefoot as much as possible (and getting crazy calloused heels). And eating cherries and spitting out the pits. Definitely a lot of cherries. You know, there is a wonderful children’s book where that is the refrain of the story. “Eating cherries and spitting out the pits.” It’s such a great book. And, I love that phrase almost as much as I love the activity (of eating cherries) itself. There’s something so rhythmic and eternal sounding underlying its simplicity. The long syllables as expansive as the days of summer. 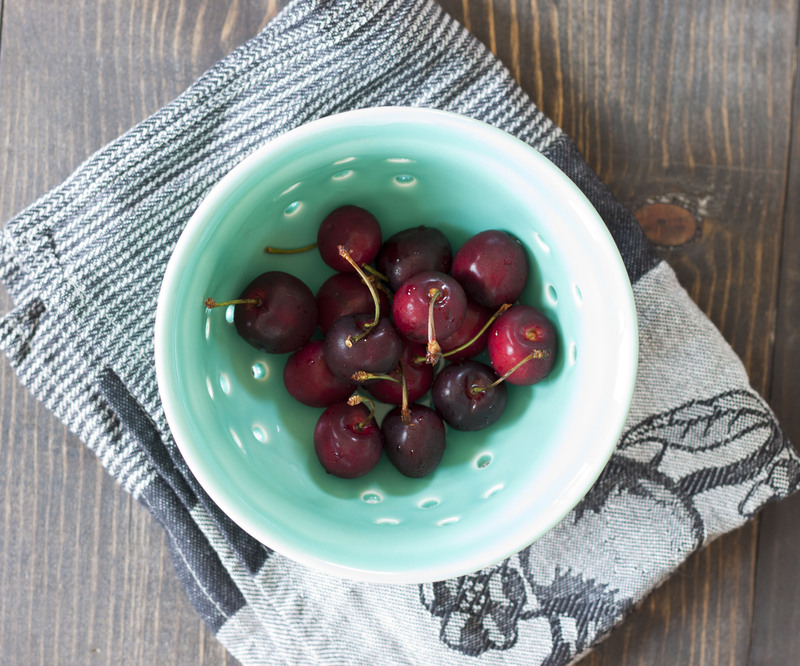 Do cherries get called the jewels of summer? They must. If they don’t, they should (although they would vie with raspberries for the title in my mind). Their deeply wine colored juice, so purple red it’s almost black, dribbles slowly, laden with nectar sweetness. When I eat cherries, I always eat too many, and make myself sick. And then I am perfectly happy to do the exact same thing the next day. It’s totally worth it. I decided that I wanted to recreate the salad for us at home. And, as luck would have it, we had some bacon at the ready. But, then the idea of BLTs staged an invasion in my mind, attempting to oust the salad. The thought of a BLT is a very powerful thought indeed. Feeling torn, I asked Joel which he would prefer for dinner. He’s opposed to having just salad for dinner on principle, so he sided with the BLTs. But, then he off-handedly suggested that I make the sandwiches with the flavors I had wanted in the salad. That was it, my friends! That was the moment of brilliance. 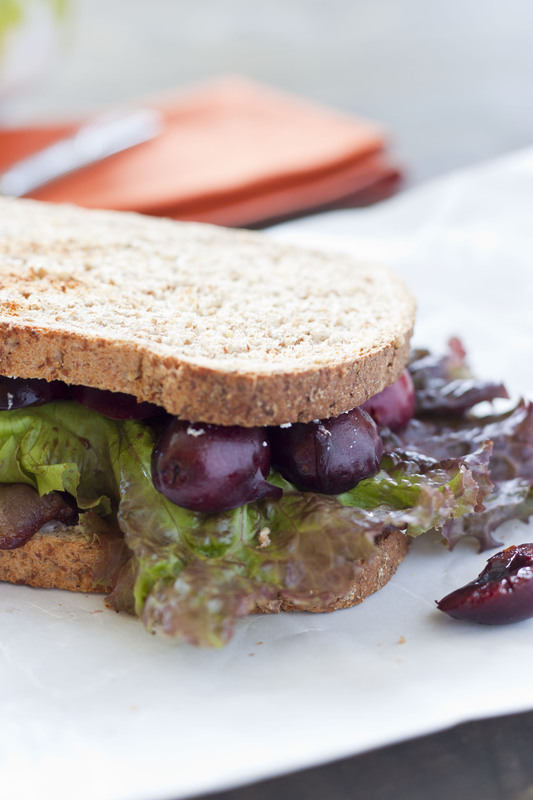 Thus was created the Bacon Lettuce Chevre and Cherry – or BLC-squared – sandwich. As with many of the dishes that turn the most satisfying and delicious, this sandwich is a study in sharp contrasts that come together to form a deliciously blended whole. 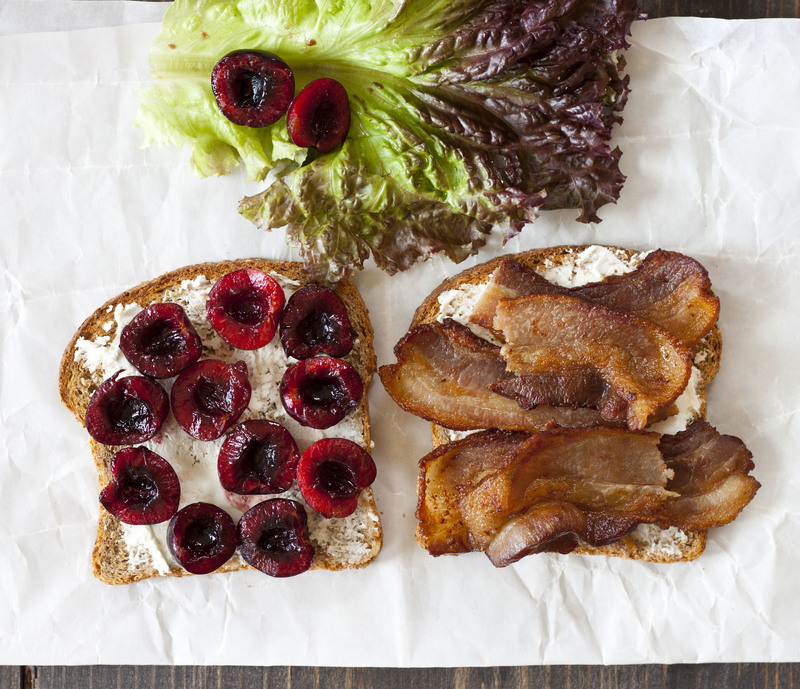 The bacon is salty and smokey, the chevre is tangy and creamy, the cherries honeyed and juicy, the lettuce fresh and leafy, the bread toasted and nutty. It’s simple and marvelous. It begs to be quickly whipped up at the end of a full summer day, just at that moment when the air begins to still and you want a treat. Have it with a crisp white wine or a hoppy beer, if you wish. And of course, you could also make it as a salad instead, if you wanted to. 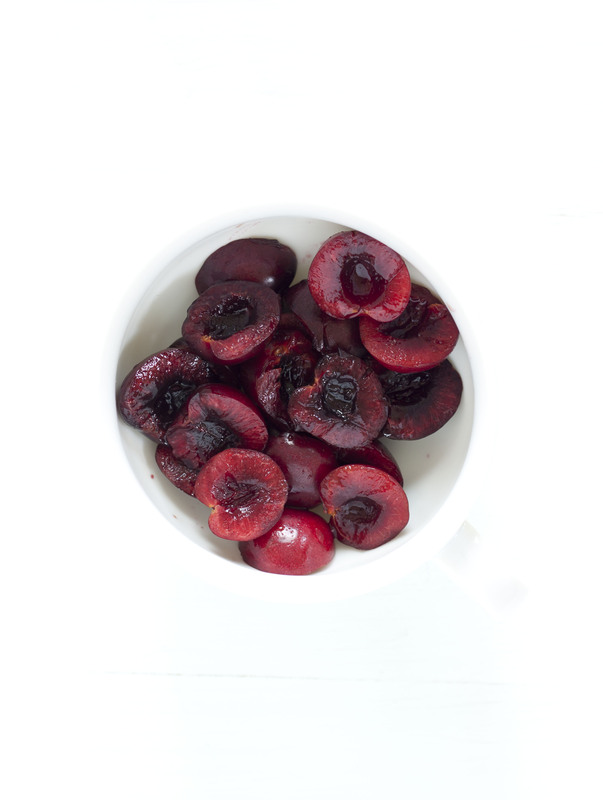 But either way, save some cherries for dessert, so you can eat them and spit out their pits. Fry the bacon until crisp and transfer it to a plate lined with a paper towel or brown paper to briefly drain. While the bacon is frying, lightly toast your bread. Spread half of the chevre on each slice of bread, while the bread is warm. Break the bacon slices in half and put them on one of the slices of bread. Carefully arrange your cherry halves on top of this, and finally add your lettuce leaf. Top with the other piece of toasted bread. Oh my. This is really something. I never would have thought of this, but I have to admit that I’m dying to try it. Give it a try! It’s surprising and soooo good! My mouth is definitely watering! Thank you for the idea! I hope you get a chance to make one! I want another right now! It sounds marvellous!! Just a pity that cherries are still so expensive in SA! I’m sorry cherries are so expensive in South Africa! Is it just because they’re out of season there now? I know here there’s a brief moment when you can get really good cherries for a good price, and the rest of the time, it’s no dice! It gonna be my new go-to breakfast!!! Thank you!!! Wow..I must make this sandwich soon. What a great combination of flavors. Your blog is wonderful. Thank you Waverly! I hope you do give it a try. It’s a little decadent, but oh so delicious! We loved this! (even on gluten-free tortillas) Brilliant idea. Some may not like the combination, but we loved it. It had that lovely contrast of salty and sweet! Try it, you may find you lived it as much as we did! I hear you and the great thing about food is there are always new and exciting things to discover! You are currently reading BLC-squared (bacon, lettuce, chevre, and cherries) at Five And Spice.